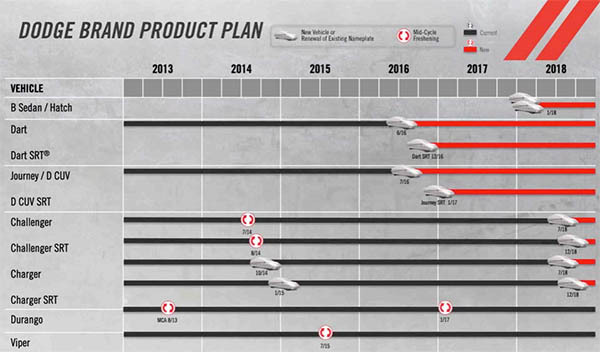 Crazy Marchionne has unveiled his "new" 5 year plan for FCA. Full of good news for truck lovers. More Jeeps. And more Jeeps. And more and more EVs! I guess now he likes them. After saying this last January: "I don't know of a business making money selling electric vehicles unless you are selling them at the very very high end of the spectrum"
I guess he finally realized a company that doesn't invest in EVs will be dead in a few years, so now he loves them. He now includes a 9 Billion Euros investment in EVs in the latest 5 year plan. Here they are (pic above) . 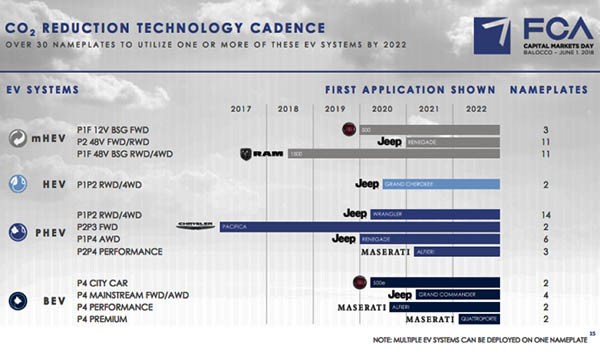 Again, all these new EVs are mostly jeep models. The truth is, he might take Fiat out of the US. And slowly kill Dodge/Chrysler. Here are a few of the stuff he was telling us back in 2014, in its previous 5 year plan BS. New Challenger, new Charger, new 300, new Chrysler 100, new Crossovers (in 2016 and 2017)!! No prototypes have been seen . No drawings or clay models. This was probably all BS to appease dealers and investors. 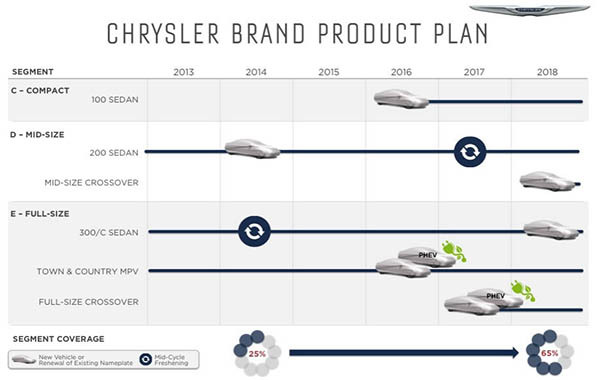 The plan was also for Chrysler to sell 800 000 cars by 2018! And 400 000 Alfas a year in 2018. With 8 new products by 2018. These lies come at the cost of the brand itself. Now the whole giant company relies just on Jeep and Ram pick ups for profits. It works now. But it won't work forever. Nothing does. Yeah, the last 5 year plan was almost completely ignored. Why does he think we believe the new plan?? Maybe the new plan is more realistic since it totally ignores Dodge and Chrysler. I guess no Chrysler Portal, yep RIP Chrysler. I did hear about a new Dodge Viper, so maybe the Pacifica will live on as a Dodge too? Too bad. Look what Ford is doing with Lincoln. I think Chrysler could have the same success. More of a entry luxury brand. Alternative to Buick, Lincoln, Mazda and folks looking at high end Chevy, Ford Titanium, Kia/Hyundai. If he’s going to keep Chrysler he needs to get over the fact that he might lose some sales at Jeep. Chrysler needs SUVs. It’s obvious Sergio didn’t want to be the CEO responsible for killing off Chrysler and Dodge, so he kicked that can down the road for his successor to deal with. Does anyone under 50 know what a Chrysler is? And if they do, does it mean anything other than "the old car with lots of chrome that never runs." Dodge seems to only mean "big v8 muscle car" or "old cheap american car that never runs"